Jonathan Smith helped recruit Jake Browning to Washington, which had one of the nation’s most explosive offenses. He’ll work against UW now as head man at Oregon State. Jonathan Smith is the next Oregon State football coach, the school announced Thursday afternoon. The Washington Huskies offensive coordinator for four seasons under Chris Petersen, Smith, 38, was the Beavers quarterback from 1998-2000, when OSU finished fourth in the country his senior season. He signed a five-year deal and will be introduced at 11 a.m. Thursday. Smith set nearly all of Oregon State’s passing records during his time at the school and led the Beavers to the 2000 Pac-10 title and a win over Notre Dame in the Fiesta Bowl. He worked as a graduate assistant at Oregon State in 2002-03. He coached at Idaho and Montana before joining Petersen at Boise State as quarterbacks coach in 2012. When Petersen moved on to Washington following the 2013 season, so did Smith. Hw will replace Gary Anderson, who quit the program last month after compiling a 7-23 record during two and a half seasons. 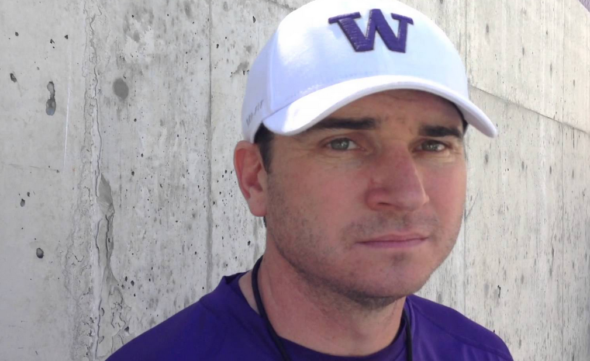 Smith, who helped recruit QB Jake Browning to Washington after he originally committed to Boise State, oversaw the most explosive offense in UW history in 2016. The Huskies tallied a school record 77 touchdowns (13 more than the previous mark) and averaged a conference-best 41.7 points per game. This season the 10-2 Huskies averaged 36.9 points per game. In contrast to the success Smith has enjoyed at Washington, Oregon State has not had a winning season since 2013 and has gone 7-29 over the last three seasons. The Beavers the past season were 1-11, 0-9. Petersen begins a search for a replacement as he waits for his 10-2 team’s bowl fate Sunday. Speculation is that the Huskies will be booked for the Alamo Bowl in San Antonio Dec. 28. This is great news. Doug Nussmeier, who made Jake Locker into a 1st round draft choice and who coached Keith Price to his best year, is available. Dennis Erickson wants back in, and at 70, he just may be the one, as he has always been an offensive guru and this would be his last job, presuming CP and he worked. Doug or Dennis – both are major steps up. No, it will in all likelihood be someone Petersen has worked with before or who he trusts to run his offense. Nussmeier and Erickson don’t fit that bill — I think Erickson will be at OSU anyway. I think it will be Hamdan, Lubick or Helfrich. I agree with you, but Helfrich has already rejoined Kelly at UCLA. That’s what I heard earlier this week sports radio. Colin Cowherd, I think?